Cabinet member Justice Minister Ayelet Shaked estimated today that chances of reaching agreements with Hamas are low. 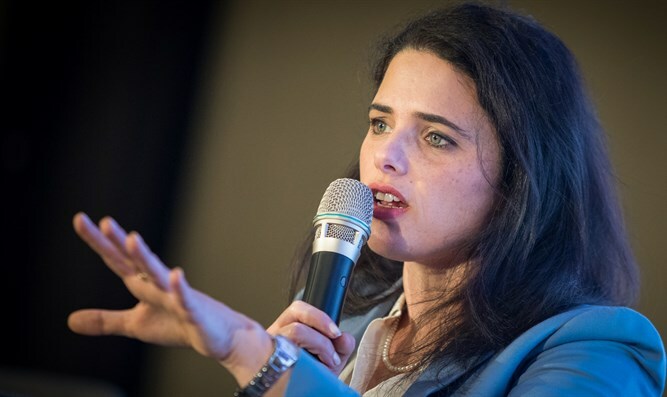 "Hamas mustn't run our lives," Shaked said. "We won't reach any arrangement that doesn't include demilitarization or cessation of expansion. "Because the chances that Hamas will agree to these terms are low, I think chances of an arrangement are low," explained Shaked. Shaked added, "We need to rehabilitate our deterrence vis-à-vis Hamas. The new reality that's recently emerged proves Israeli deterrence has been damaged - we must recognize this and not bury our heads in the sand." More than 140 rockets have been fired since last night at the area around Gaza. One woman was seriously wounded and several others were lightly injured.